If asked to picture a yabby, it's easy to imagine a small freshwater crab you can catch in a farm dam with a piece of old meat attached to a string. Kids keep them in aquariums or they end up on our plates, served with a bottle of beer. Russian researchers, however, have taken the humble Australian red claw crayfish and given it an important role: protector of St. Petersburg – the second largest city in Russia, with a population of more than 5 million people. Not all cities are fortunate enough to draw their potable water from well protected dams and reservoirs, like Sydney and Melbourne. Many cities in Europe rely heavily on multi-step water-purification processes, and this is also frequently the case in Russia. Even then, not all pathogens can be eliminated or detected in enough time to ensure public safety. Detecting dangerous substances quickly, to prevent them from entering the water supply in the first place can be critical in protecting the health of millions of people. Physico-chemical analysis of water-quality targets only looks at a limited set of parameters and it's relatively slow and can't always produce results in real time. This is where biological indicators can play an important role as early warning systems – similar to the old concept of taking canaries into coal mines. 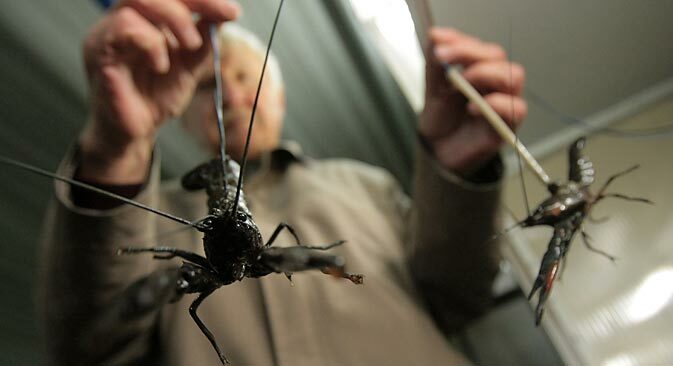 Vodokanal, St. Petersburg's water-supply agency, has chosen the river crayfish as its ”canary” – one that can protect its population from unforeseen water contaminants or even, potentially, terrorist acts. To measure the yabbies' heartbeats, optical fibre connected to recording equipment is attached to their hard outer shell (or carapace). From there, the heart signal is recorded and digitised, much like a hospital ECG. While Vodokanal uses Russian native crayfish during cold weather, in summer, when the water temperature gets above 21C, heat-loving yabbies from Australia are enlisted to do the job. To understand how the crayfish (and their heartbeat) behave in normal healthy conditions, the animals were first monitored in clean, pollution-free water. This monitoring led to two conclusions. The first, that only male yabbies of around the 3-to-5-year-old age-bracket are suitable for the job. Female yabbies are more likely to have heartbeat fluctuations, particularly during breeding time. What’s more, the crayfish need to be resilient enough to not get stressed out by living close to noisy water pumps and to be calm with people constantly observing, feeding and handling them, not to mention, having an optical fibre permanently sticking out of their shell. So that the yabbies felt more comfortable in these unnatural conditions, Vodokanal set up its own yabby farm where their ten-legged co-workers are bred in conditions similar to their future work-place – that is, in a noisy environment, surrounded by human activity. This way, when the yabbies are placed in their work tanks, they stay calm and can maintain a steady heartbeat. This innovative technology, which was developed at the Research Centre of Ecological Safety, at the Russian Academy of Science, has been successfully operating in St. Petersburg, and all its satellite cities, since 2005. This kind of bio-monitoring isn't unique, however. The behaviour of fish and snails has been analysed for similar purposes; but the Russian innovation here is the capacity to judge a small animal's stress-level, by measuring its heartbeat. The head of the Laboratory of Bioelectrical Methods for Ecological Monitoring, Sergei Kholodkevich, was behind the innovation: he invented and patented the method of using large and relatively long-living invertebrates to measure air and water quality. Apart from yabbies, he has also used giant African snails to monitor the air-quality coming out of sewage-plant incinerators.